The 11 bedroom guest accommodation, trading as ARLINGTONS, can cater for the needs of many visitors. The following statement is a summary of the facilities provided. If you have any questions which haven’t been addressed in the statement, please get in touch. The physical structure and layout of the building makes the premises unsuitable for people with serious mobility impairment. It is possible to accommodate guests with a hearing or visual impairment if they are accompanied so as to ensure their safety. Information about ARLINGTONS can be accessed via its website. Contact is available via a standard telephone, e-mail, or if booking a room, this can be done securely via our website which will show the 'live' availability of rooms. Details can be found on the final page of this statement. The access statement can be found in all the welcome folders. A version in a larger font is available on request. The nearest bus stop is approximately 5 minutes walk away. Trams go right along the Promenade from Starr Gate to Fleetwood. The nearest tram stop on the promenade (Blackpool Tower) is about 10 minutes walk away. The nearest major train station is Blackpool North (0.34 miles), which is either an 8 minute car or taxi journey away or approximately 15 minutes walk. Manchester Airport is 58 miles away (via M61, M6 & M55) - 1 hour 15 minute car or taxi journey away. A taxi can be booked for you. Please ask. Liverpool Airport (John Lennon Airport) is 63 miles away (via M62, M6 & M55) - 1 hour 20 minute car or taxi journey. For the most up-to-date information on public transport accessibility issues, please contact the relevant authority. Blackpool town centre is approximately 3 minutes walk away. If arriving by car, the large pay & display car park is situated approximately 100 yards away, on the junction of Adelaide Street & Leopold Grove. A contact telephone number is displayed externally. Access to the standard single width front entrance door is via six stone steps. The entrance hall is on the level and has a fitted carpet. Seating is available in the reception area. Telephone contact is available by the landline number & can be found on the final page of this statement. All prices are available at reception. The door to the breakfast room leads off the 1st floor landing. The building has 4 floors, ground, 1st,, 2nd & 3rd. Except for bedrooms all public areas are on the ground floor. Corridors, stairs, bedrooms and public areas are well lit and are fitted with carpet. The breakfast room area has a wooden floor. The stairs throughout the building are of normal dimensions. There is a WC in the ground floor reception area. 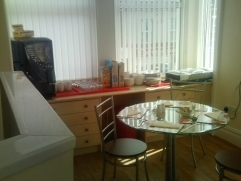 Breakfast is served in the dining room on the first floor. Dining room furniture can be moved on request. Chairs are all without arms. Special diets, i.e. vegetarian, can be catered for with prior notice. Anyone with a life threatening allergy, to peanuts, shellfish etc can be catered for only after discussion with staff regarding dietary needs. The outer front door is closed around 21:00 & access is via internal keyed door. A television set is located in the dining room area. There are 11 bedrooms in total. All bedrooms have fitted carpet. There is 1 bedroom on the first floor. 1 family room (1 double bed, adult size bunk bed). There are 4 bedrooms on the second floor. 1 family room (1 double bed, adult size bunk bed). 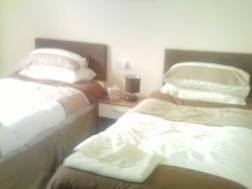 2 twin rooms (2 single beds). 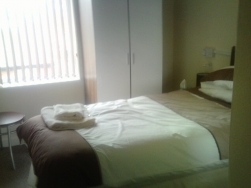 1 double rooms (1 double bed). There are 5 bedrooms on the third floor. 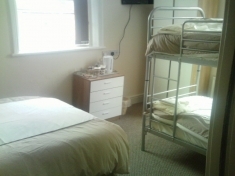 2 single rooms (single bed). 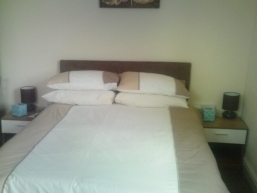 3 double rooms (1 double bed) 1 Triple room (3 single beds). All beds are accessible from both sides. Each bedroom has a flat screen colour television with remote control. Each room has an electric kettle. All bedrooms have standard fire doors and smoke detectors. All bedrooms have en-suite facilities containing shower, toilet & wash basins. All en-suites are tiled with linoleum flooring. ARLINGTONS is open all year except for the Christmas period. A L2 fire alarm system is fitted which very loud sirens in all bedrooms. Front door to be used for evacuation. Emergency lighting is fitted throughout the building. There is a water filled fire extinguisher on all floors. All rooms are provided with a welcome folder. Amongst other useful information this contains the main telephone numbers for enquiries & for emergency use. ARLINGTONS is situated on the corner of Albert Rd & Leopold Grove - Vehicular access is via Adelaide Street then left into Leopold Grove & ARLINGTONS is last building on the left. ARLINGTONS, 26 Leopold Grove, Blackpool, Lancashire. FY1 4LD. Hours of operation: 24 hours in the event of emergencies. Local taxi: C Cabs 01253 292929 & they accept debit/credit cards.